Airy, Airier, Aerogel. Until now, brittleness has limited the practical application of these delicate solids, which consist almost entirely of air-filled pores. This may now change: In the journal Angewandte Chemie, Japanese researchers have now introduced extremely elastic aerogels that are easy to process and can be produced at low cost. Their success relies on a doubly cross-linked organic-inorganic network structure with adjustable network density. Aerogels can be made of a variety of materials, all of which are brittle, which makes processes such as cutting, drilling, or milling, nearly impossible. In addition, the drying process they require is usually an expensive affair. In the team led by Kazuki Nakanishi and Kazuyoshi Kanamori at Kyoto University (Japan), Guoqing Zu has now developed a new class of unusually elastic aerogels. Their materials are based on the monomers vinyldimethylmethoxysilane and vinylmethyldimethoxysilane, which are initially linked into polymer chains by a radical polymerization using the double bonds in their vinyl groups. The polymer chains have organosilicon side chains (silanes), which—depending on the monomer—have one or two methoxy groups (-OCH3) on the silicon atom. These groups participate in the next step, a cross-linking reaction at one or two places in the silane side chain, depending again on the monomer. This polycondensation forms siloxane bridges (-Si-O-Si-). The density of the resulting cross-linking of the polymers (polyvinylpolydimethylsiloxane-polyvinylpolymethylsiloxane copolymers) depends on the ratio in which the two monomers were mixed. Subsequent inexpensive air pressure or freeze drying then forms aerogels with tailored porosity. Thanks to their flexible siloxane and hydrocarbon chains, the delicate structures are highly elastic. They can be bent, rolled, twisted, and cut into desired shapes. The more densely crosslinked versions exhibit high thermal insulation, surpassing conventional materials like polyurethane foam. Also of interest is the selective absorption of the aerogels: exposed to a mixture of hexane and water, they exclusively absorb the hexane, which can subsequently be removed by squeezing the material like a sponge or by evaporation. This process can then be repeated until the mixture is fully separated. This allows solvents or oils like acetone, toluene, mineral oil, and kerosene to be separated if they accidentally enter a body of water, for example. 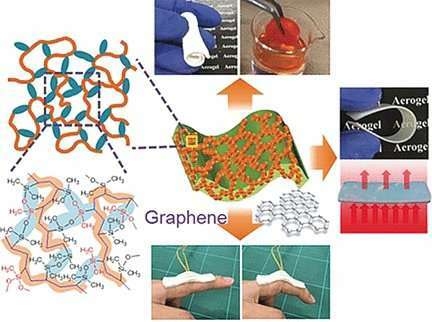 The researchers have also produced composites with these polymers and electrically conducting graphene nanoplatelets. Under pressure, the graphene platelets move closer together, reversibly increasing the conductivity. Possible uses for this property include touchpads for electronic devices and wearable electronics. Aerogels can be made of a variety of materials, all of which are brittle, which makes processes such as cutting, drilling, or milling, nearly impossible. Aeorgels are fascinating and the best insulators they will probably ever have. Lasers could be used to "drill" it.